With a beige backdrop, the Robin's Moroccan-style pattern will give your room striking appeal. Alternating geometric shapes create dynamically designed rows on this soft-touch polypropylene piece. Power loomed with a pile that measures nearly a half-inch thick; you can use this accessory to freshen up just about any space—from your living and dining room, to a den or bedroom. Love the colors. The rug looks very nice, my kitties love it. The quality it’s not the best, it’s more plushie than a regular rug. Stays on place and doesn’t shed at all. I will keep it. Beautiful rug!!! Bright colors that bring tons of style to our space. The rug itself is well-made for the price, though still thin. We have the rug under our round modern kitchen table. We are pleased with the purchase! This rug is so cute! And soft too. I love this. It brings the room together! 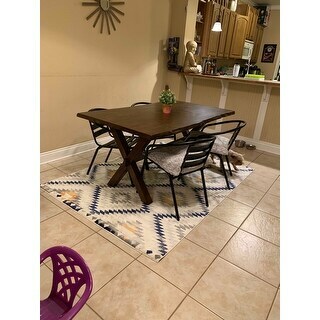 We were looking for a rug for so long so to finally have found this rug and for such a great price was amazing!!!! We are so happy with this purchase! Definitely recommend! This is a beautiful Rug! Extremely soft! i have it in my kitchen and would be beautiful in a bedroom, living room too! highly recommended! I love this area rug!! It's super soft and looks like high quality. I like the neutral colors and modern style. Love this rug! The colors are exactly like the photo and the quality is great. We put it in our finished basement. It gets a lot of use and is holding up well. This rug is so cute! You will definitely need a rug pad to go underneath, but the aesthetic is there. I love it in my dining area! The only issue I had with the rug is the pattern on the area where it was taped during packaging is very noticeably unaligned. I’m not sure if it will take time to work itself out or if its staying. I guess only time will tell. Otherwise I am satisfied. The colors in a picture are accurate and bright. The rug made a small room feel larger! I love the fact that it does NOT shed. My son loves it as it ties in nicely with gray walls and nave bedspread in his room. I am very pleased with this purchase. This rug is absolutely GORGEOUS! I’m in love with the colors. 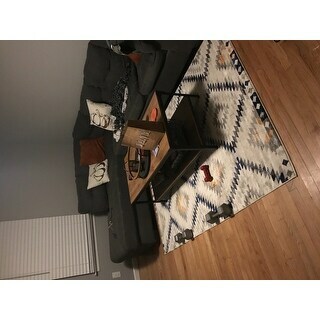 It isn’t super thick but it is very soft and looks perfect in my living room! Hoping it holds up well with my two dogs. Very cute! Has been about 4 months in use and has held up great! I love it. Exactly as pictured. Love this rug! So soft. Just the right amount of pop of color to add to our mostly neutral home. So far so good. It fits perfectly in our office area and blends well with the rest of the decor. LOVE THIS RUG! It is beautiful and looks much more expensive than the price. Love the design on this rug. I put it next to my mustard sofa and this rug makes the whole room pop. I really like the orange, blue, grey and white tones! This rug is so beautiful!! The yellow is more of a gold than it looks in the pictures, but it is absolutely stunning. It is also extremely soft. It completely changed the look of my dining room & pulled it all together. I can't even tell you how many compliments I have gotten on this rug! Obsessed with this rug. It looks so cute and really helps to brighten up the room. "Does this come in a runner size?" "What are the colors in the rug?" Lache Modern Diamond Bohemian Area Rug - 5'3"x7'0"